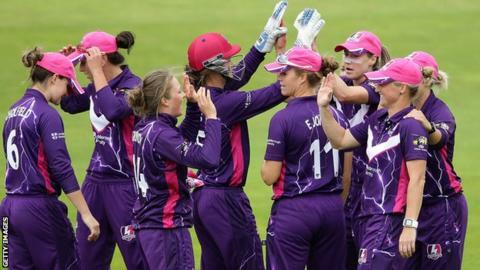 Loughborough Lightning secured a 43-run, bonus-point win over Yorkshire Diamonds in the first match of the inaugural Super League at Headingley. The match attracted nearly 1,000 fans and was lit up by Loughborough spinner Rebecca Grundy's 3-21. New Zealander Sophie Devine's excellent 52 helped the visitors to post 128-9. In reply, the Diamonds never recovered from having home captain Lauren Winfield controversially run out for 23 and they were bowled out for 85. Lightning's decision to bat in the first ever professional women's domestic cricket match looked suspect when captain Georgia Elwiss was stumped off Danielle Hazell for 10, having danced down the track to the spinner. The visitors recovered well through Devine and Ellyse Perry, with the former clubbing 14 off Katie Levick's first over, including a huge six that sailed almost 15 metres over the long-off boundary. However, Loughborough's innings hinged on Perry's run out by wicketkeeper Beth Mooney, as the Australian all-rounder's side slipped from 85-2 to 97-7, including Devine being brilliantly caught in the deep by Jenny Gunn off Levick. A few lusty blows from Paige Scholfield and Eve Jones, though, restored some forward momentum in the final overs. The Diamonds never looked like getting close to their target after England opener Winfield walked back to the dugout in disgust - having felt she was obstructed by Perry. Spinner Grundy and medium-pacer Elwiss took 5-27 between them in seven overs as they strangled their opposition, dismissing Yorkshire with 17 balls remaining. Loughborough Lightning all-rounder Sophie Devine: "It was nice to get some runs on the board, I felt we were 15-20 runs short and it didn't help when I ran out Ellyse Perry. "We bowled fantastically well as Yorkshire came out really hard at us, which we knew they would, so it was a great team effort. "With the sizes the boundaries are, we know how important fielding is going to be. Every run counts, and we have had a real focus on diving. "It is a real honour to be here, be playing in this competition and with and against so many great players."